This section details the available components and options available for use in the destinations API. For the overview visit this article. Note: To send a file you need filename, file_data and content_type parameters. 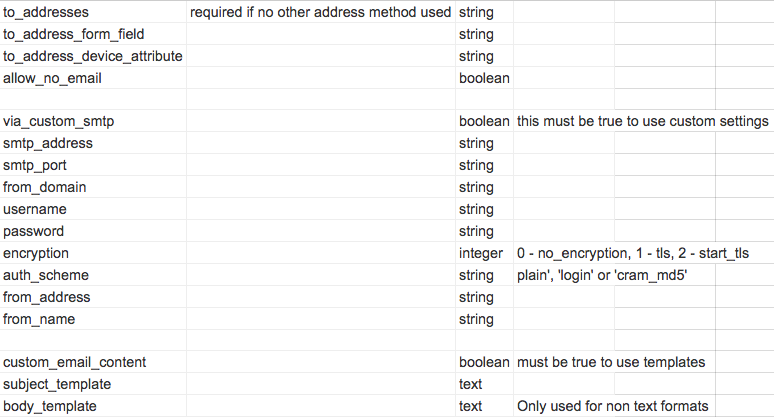 Note: Custom header keys and values are hashes paired by their keys in the hashes. NOTE: form_field_templates is an object hash containing the fields you want to pre-populate mapped to their values. The following transports need accounts to have been authorized / created in Device Magic. So first create a destination using the account you want to use for the API and then use the email in the component. NOTE: delivery_column_templates is an object hash containing the columns you want to pre-populate mapped to their values.